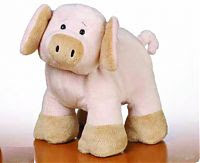 This webkinz new floppy pig is brand new and has just been added to the webkinz club. Alright! This webkinz loves a pile of mud pie flapjacks. So loving and gentle. What a wonderful addition to your family and your collection. Be ready to have alot of fun with this little piggy.